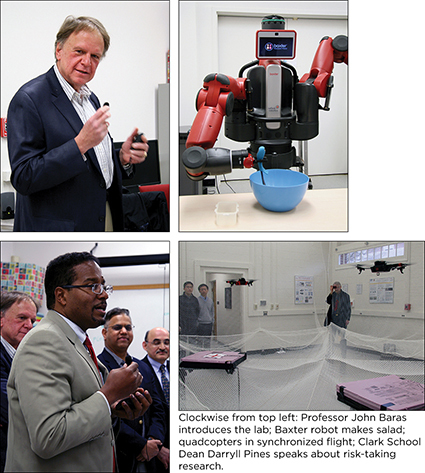 The Autonomy Robotics Cognition Lab held an inaugural celebration on Monday, Feb. 9, attended by administrators, faculty and students from across the University of Maryland. The ARC lab is a joint lab of ISR (Clark School) and UMIACS (CMNS). It is directed by Professors John Baras (ECE/ISR), Yiannis Aloimonos (CS/UMIACS), Cornelia Fermüller (UMIACS) and Don Perlis (CS), bringing together leading-edge approaches in systems engineering, autonomous robotics, computer vision, and cognitive computation to create a diverse research environment supported by experts in multiple domains. Offering remarks were DARPA program manager Reza Ghanadan, Clark School Dean Darryll Pines, UMIACS Director Amitabh Varshney, ISR Director Reza Ghodssi, Maryland Robotics Center Director S.K. Gupta, and Professor Baras. Attendees viewed two demonstrations. In the first, a Baxter robot processed scenes to learn sequences of commands—in this case it learned to make a salad by watching a human do the same thing in a YouTube video. This work by ISR-affiliated Yiannis Aloimonos and Cornelia Fermüller has received much media attention in recent weeks. In the second demonstration, two quadcopters performed synchronized aerial maneuvers using only basic onboard sensors and cameras rather than external motion-tracking cameras. The experimenters follow model-based systems engineering methods to create modular software that can autonomously launch, fly and land the multiple aircraft. This work is under the direction of John Baras.